The orthopedic unit at Millard Fillmore Suburban Hospital allows those recovering from surgery or a serious injury to do so in spacious, comfortable rooms while being cared for by experienced professionals. Many of the area’s largest private orthopedic surgeon groups choose to practice at Millard Fillmore Suburban Hospital, and they do so for a number of very important reasons. Millard Fillmore Suburban Hospital boasts 13 state-of-the-art operating suites. The orthopedic unit has 13 private and 12 semi-private rooms featuring floor to ceiling windows, flat screen TVs, and hotel-like furnishings for a more relaxing stay. In recognition of the fact that many family members of those having joint replacement surgery are older and find it more difficult to get around, elevators accessing the orthopedic floor are immediately to the left upon entering the main lobby. Located just steps away from orthopedic patient rooms, the new therapy suite is a bright, cheerful room that is equipped with everything needed to start patients on the road to recovery. Computerized navigational equipment for the most precise fitting of artificial knee joints, specialized lighting, audio/video integration, touch screen paging system and a variety of clinical equipment are features in the orthopedic division. The orthopedic staff is specially trained in orthopedics, with several decades of combined experience and they regularly receive training on new techniques and new technology. 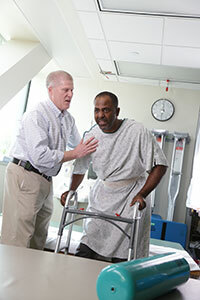 Full-time orthopedic nurse practitioners are on staff and dedicated to post-operative care. Comprehensive pre-operative classes are held to ensure patients have all the information necessary for successful surgical and recuperative outcomes. For more information or to register for a class, call (716) 568-3540. On-site physical therapy and occupational therapy, coupled with access to subacute or in-home, post-discharge physical therapy ensures patients have the right form of therapy for their individual needs. To speak with a physical therapist, call (716) 568-3540 and ask for the orthopedic physical therapist. Each year, approximately 500,000 people (two-thirds of them women) have knee replacement surgery. For the vast majority, the procedure eliminates pain and increases mobility, allowing them to return to a more fulfilling, active lifestyle. Total knee replacement, also called arthroplasty, is a routine surgical procedure that realigns the joint (bone end surfaces) with man-made materials such as plastic, ceramic or metal. It is preformed when the damage to the knee causes constant pain, loss of mobility and diminished quality of life. At Millard Fillmore Suburban Hospital, orthopedic surgeons utilize the latest, most precise computerized navigational technology to ensure a perfect fit of the new knee joint. A program for joint replacement candidates undergoing surgery at Millard Fillmore Suburban Hospital or Buffalo General Medical Center that guides a person prior to surgery through recovery and discharge. Click here to learn more about Kaleida Health's joint replacement program. Much like knee replacements, total hip replacement is indicated when range of motion becomes limited and substantial, continuous pain is present. The need for hip replacement surgery is usually caused by arthritis, injury or tumor. During total hip replacement surgery, the damaged parts of the hip are replaced with plastic and/or metal parts. The surgery basically rebuilds the hip by replacing the ball, socket and stem. Total shoulder replacement surgery is less contrary to popular belief, the knee joints of men and women are not the same. The angle between a woman’s pelvis and the knee, which affects how the common than hip or knee replacements, but the process is basically the same. The damaged joint is replaced with a plastic and metal implant, which replicates a person’s shoulder joint. Shoulder pain is commonly caused by rotator cuff tears. The chance of rotator cuff damage increases with age, is most prevalent in the dominant arm and is usually caused by tendon degeneration rather than injury. One of the most common orthopedic surgeries is arthroscopic knee surgery. During the procedure, a camera is inserted into the knee through a very small incision (about a quarter of an inch). In a separate small incision, the surgeon inserts instruments to remove damaged ligaments or cartilage. Arthroscopic wrist and ankle surgery is used to repair ligaments, fractures, carpel tunnel syndrome, loose bone fragments, or inflamed or damaged joints caused by arthritis. Foot surgeries performed at Millard Fillmore Suburban Hospital include bunion and hammer toe surgery and fracture repair. Surgery is performed on simple bone fractures in which the break is incomplete and the bone doesn’t break the skin.